" She is an enchanted princess from the South of France who lives a charmed life and only ever wears beautiful clothes." 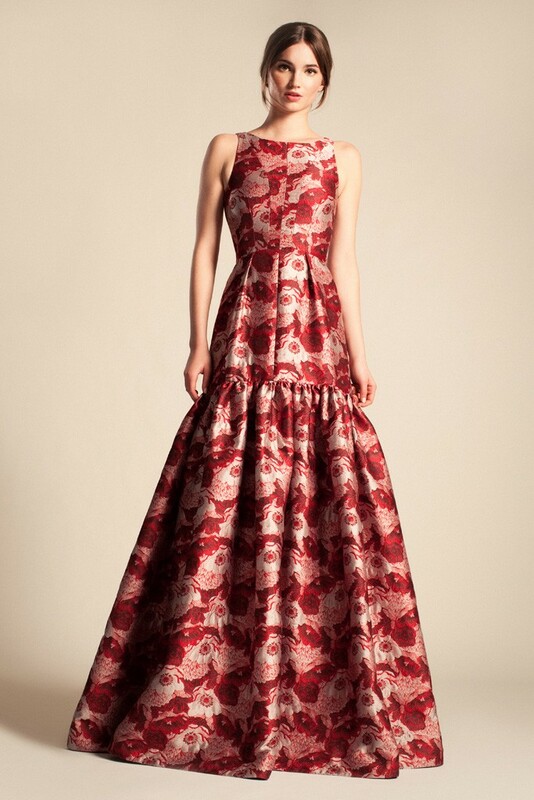 is Alice Temperley's description of the muse for her perfectly enchanting Resort 2014 collection. Sumptuous lace and jacquard fabrics take on the most ladylike silhouettes punctuated with decadently simple embellishments like floral embroideries and petal appliqués. The ethereal evening gowns, vintage inspired sheath dresses and flowy skirts really do befit a princess. It's really no wonder why this is one of Kate Middleton's favorite labels. 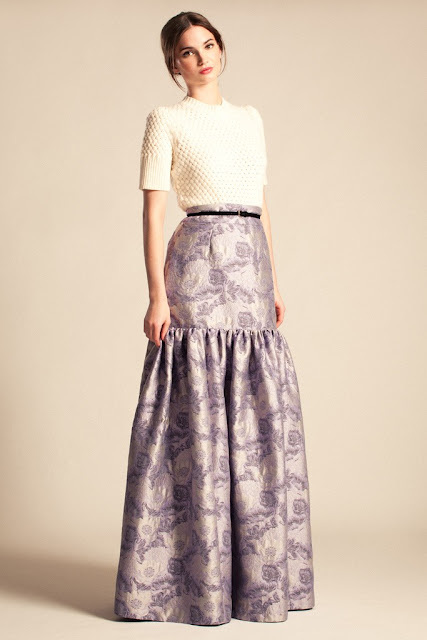 I adore this collection for it's modest styles and vintage luxe aesthetic. What are your thoughts on it? And what are some of your resort 2014 favorites? Google Reader is shutting down July 1st. If you haven't found a new reader yet, be sure to check out out my breakdown of some alternative readers. I love, love Temperley! Alice creates the most luxurious, yet wearable designs! I stopped by a Temperley sample sale in London once and was bummed they didn't have more gowns! wow - everything here is so gorgeous! my fave is the long white floral dress. so stunning! Rowena, I am loving the first and last dress! So pretty! I've always been a fan of Temperley. 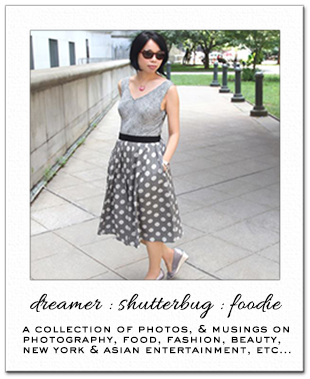 When I first started blogging (my old blog) I talked her collection at the time and showed an interesting video about how she got started. How very beautiful and fairytale like. The first one is my fave. Gorgeous and very romantic pieces! Wow! Stunning! The first dress is gorgeous.. such richness in the color and fabric. Lovely resort collection. These pieces are so beautiful, feminine, and very stylish. These dresses are absolutely gorgeous. Ooo wow that last dress in particular is stunning!! As I scrolled down, I was thinking each look is more beautiful than the next! What a stunning collection, i could see myself wear every look (In an alternate millionaire universe of course). The gowns are wonderful, just when I was looking for some design inspiration for an event. How are you feeling hun? Omg this is one of the most beautiful collections I've ever seen! My jaw is dropping to the floor! This collection is so lovely and more especially the first dress! The collection is really pretty. I think I like the black skirt/white shirt outfit the best. Look at these gorgeous dresses! So feminine and pretty! Ah, resort collections are always among my favorites. The last two dresses are beautiful! The palazzo pants are so beautiful! That first dress is tdf! They are all stunning though! Love! You are invited to my "International Giveaway sponsored by Naked Minerals". Wow! These are stunning dresses! I love the red one at the top the most! Classic! OOOOHHHH my, this is so pretty! Absolutely beautiful.